I spent my Monday off this week making slow cooker chilli and cracking out my sewing machine. I had tried to start a sewing project earlier this year only to find that my sewing machine box had everything in it, (including a VHS tape with no label on it?!) everything that is except the plug and foot pedal. The other week though my Mum turned up to our spa day with the plug and pedal, whey! We had no idea how they got separated but I'm very happy to now be able to crack on with all the projects that I've been planning, especially in the run up to the big C. We've been having problems with our kitchen/living room door recently. It seems that a nail has worked it's way to the bottom of the door which has been leaving a big scratch on the floorboards in the living room. We haven't had time to sort the problem out, as we've been prioritising other things, so have been propping it open with anything we can find- shoes, plant pot...ketchup bottle. I bought a couple of really lovely fabric scraps from the quilting shop in Rochester so thought I would use one to make up a doorstop. On looking at the pattern and the fabrics though I figured I needed a more hardwearing fabric, and probably a darker coloured one as it will probably get a bit dirty being on the floor so headed into Canterbury to pick up something else. 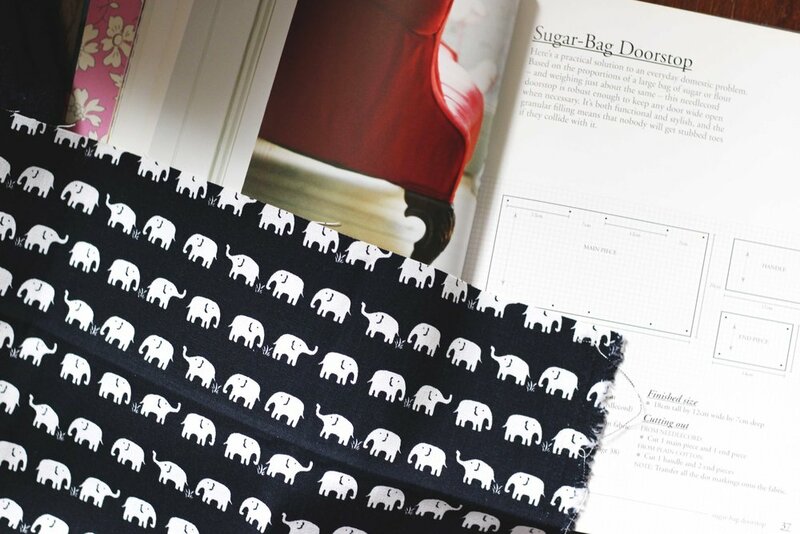 I found this really cute elephant print fabric in C&H Fabrics which was much sturdier than the cotton fabric I had at home and chose a plain grey to make the handle of the doorstop. For the pattern I used the sugar-bag doorstop one in The Liberty Book of Home Sewing which my sister gave to me a number of years ago. It turned out to be a really quick project so it only took me a couple of hours, with a break for lunch, to make it. I could probably have been speedier had I not had to troubleshoot my sewing machine which kept on having problems with chewing up the thread. But for it's first time out in a few years I'm pretty happy that it even still worked! The pattern was only made up of four pieces as the main central piece is just one big cylinder with a single seam. I filled it up with lentils and brown rice which was probably the trickiest bit as I did end up with dried lentils all in my lap a couple of times. I'm really pleased with how the doorstop has turned out and it's a bit more stylish than a ketchup bottle! If you liked this post you might like Autumn Foraging or Did I Ever Mention?